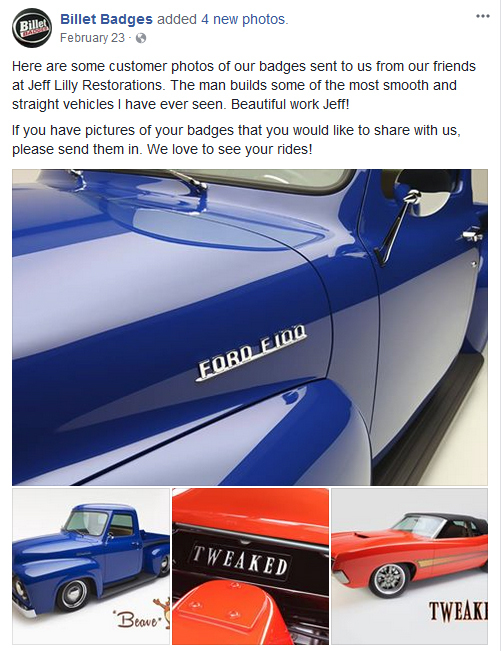 The world famous Barrett Jackson Auction Company endorses our facility as providing the Highest Quality workmanship. Click here to see the finished 63 Galaxie "Behemoth"
Clothing designer Mossimo Giannulli... Jeff, You're a genius.... unreal job! The likes of which I've never seen. 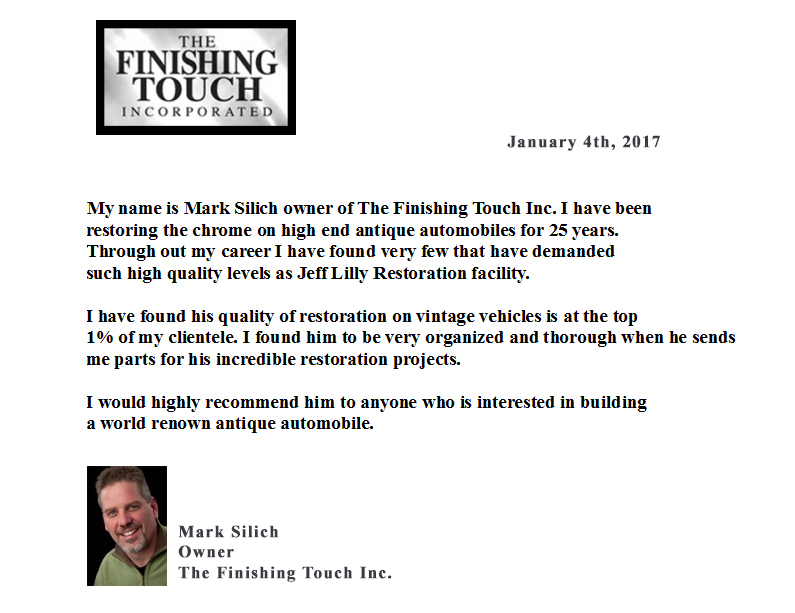 I have found his quality of restoration on vintage vehicles is at the top 1% of my clientele. Jeff, it got here great it is one of a kind, will let you know more when I can! It is a head turner and people love the color and the vibe. The fit and the finish and the details knock people out. It rides and drives wonderfully well and is really everything I hoped it might be. The car is beautiful and very functional. I drive it more than you might have thought I would and take chances with it by doing that of course, but I didn't build it to look at. I had planned to drive it to FT, worth a couple of weeks ago for the big show there but had something come up. I would not hesitate to drive it across the country if I needed to. I have had more than a few serious car guys tell me it is the finest 57 they have ever seen. And of course I agree with them. Click here to see the finished 1957 Chevy "Timeless"
The car is a masterpiece, I almost can't speak when I see it. Click here to see the finished 1958 Corvette "Panama"
Jeff, the car is fantastic. Everyone loves it! Click here to see the finished 442 "Snow White"
I just wanted to let you know that I absolutely love the car, and had the opportunity to take it out for three or four great drives before they started salting the roads. Once I got the hang of the clutch, transmission, and gas pedal (it took me a while), things went pretty smoothly. I believe your judgment on the exhaust note is perfect. It is a beast, and a whole lot of fun. I sincerely hope you have a fun and intimate holiday season with your family. Click here to see the finished 1971 Chevrolet "Way-Gone"
Click here to see the finished 1971 Truck "Big Blue"
Jeff, during our conversations I have the feeling we can communicate and work together well. I am from Europe, Germany. Current work: Architect, Engineer, Thailand and International. 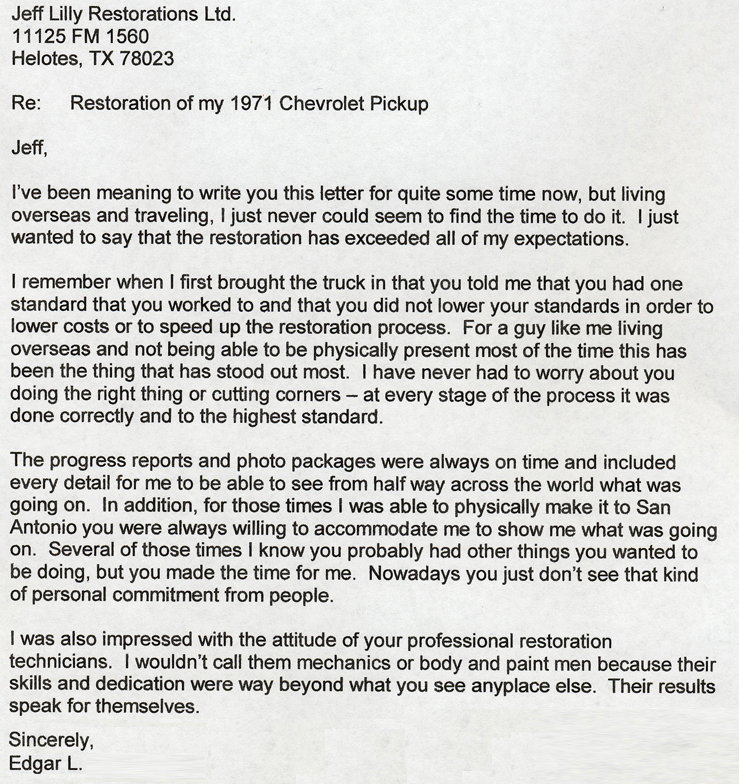 You must know, the thing I love the most is your body work and restoration quality. The finishing is without comparison. You also got good photographers, and know how to set things in the right light. I can see and accept when someone is better in field; obviously you are in this field. 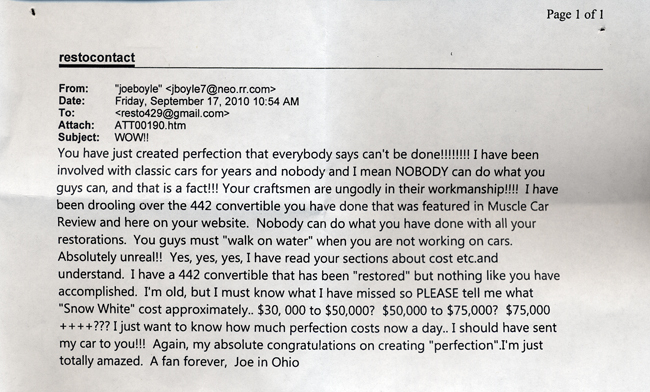 Meaning I will let you design and build this car project. The man builds some of the most smooth and straight vehicles I have ever seen. Beautiful work Jeff! This is truly the finest 57 I have ever seen, every detail is perfect. Every gap, panel, wire, and not one wrinkle in the seats! "That 57 is absolutely beautiful. It doesn't get much better than that. I agree, it's not over done at all." 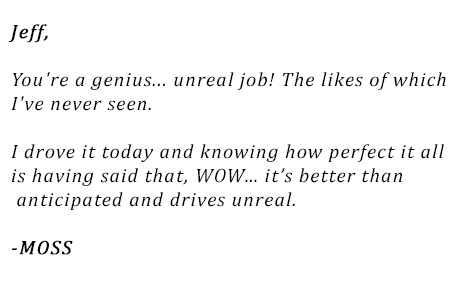 "Not only is the workmanship perfect the design choices are perfect too!" 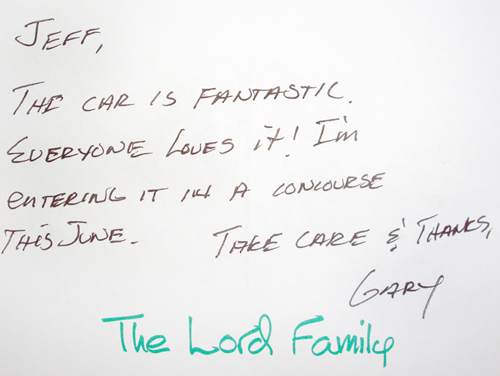 Click here to see more of these impressed Classic Car Enthusiast comments within a popular forum. 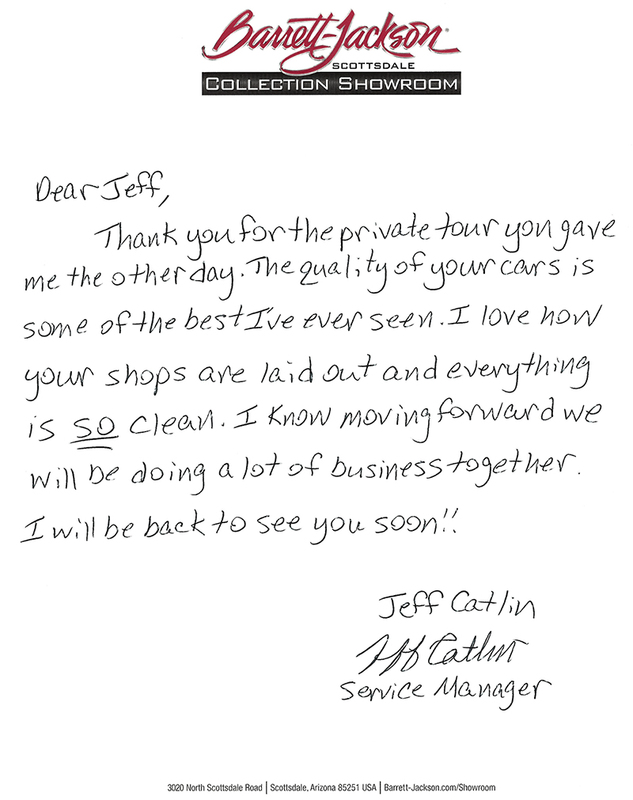 Click here to see these car enthusiasts comment on the quality of workmanship that Jeff Lilly provides! Mr. Lilly, by way of introduction my name is Frank Fidelibus of Houston. 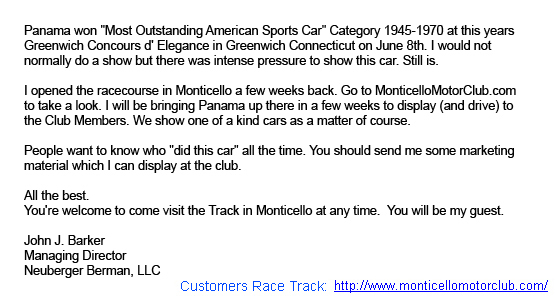 I am 58 years old and always been involved in the classic car business. My father had a body shop and mechanic shop as I was growing up, he restored 356 and 914 Porsche’s and T-Birds now and then. We place 2ND in the Palm Springs event in 1972 for T-Birds. I must say I have never seen any vehicle restored that comes close to your perfection. You attention to fit and finish are the best I have ever seen. I pride myself on doing a good job when I do small things to my vehicle like putting in USA made items when I can find them. I see in some of your photos USA made gauges, how nice. Click here to see the 1950 Ford Truck "Ol' Yeller"
I just wanted to let you know that it is a pleasure doing business with you. Upon my first visit to your shop I knew I had found someone who takes pride in his work. I have enjoyed a welcome sense of doing business, a place where the ethics of years ago are still in place. The progress of the work has been photographed and recorded, and each part of the job has been gone over in detail. You guys have really got it together. I'm a car freak anyway, and when I see people who are really serious about restoration, I think it's pretty cool. You can tell when someone is so very good at what they do that they give away trade secrets knowing full well that trade secrets are only as good as the professional skill needed to actually do the work. You can tell when someone is so very good at what they do that they give away trade secrets knowing full well that trade secrets are only as good as the professional skill needed to actually do the work. This is certainly true of your page on block sanding techniques. I have restored about a dozen Jaguars with OK but, by your standards, marginal paint jobs. I’m currently working on a 1960 XK-150 coupe and the basic car is so good that I want its paint job to be the best I have ever done. The information I have learned from your site is awesome and I truly thank you for putting it on the internet. Essentially the most important thing I learned is that “work takes time,” there is NO shortcut for a quality end result! FYI, I’m attaching 2 photos of the last car I completed which looks pretty good, but this next one will be far better. Thank you again for the great information and I hope my end result will be a tenth the quality of your “average” job! You have just created perfection that everybody says can't be done!!!!!! I have been involved with classic cars for years and nobody and I mean NOBODY can do what you guys can, and that is a fact!!! Very very impressed. That cream Cougar is a work of art. Your panel gaps are perfect, the sign of a master of restorations. Dean and I had a look at your web site. Very very impressed. That cream Cougar is a work of art. Your panel gaps are perfect, the sign of a master of restorations. Dean did his apprenticeship in restoration. His apprenticeship car, a Healey 3000, was shipped (by invitation only) from Australia to Switzerland to compete in the world’s most prestigious Healey concourse. His car won outright best Healey in the world. After looking at your website, he said you know what you're doing. Hey buddy you have an incredible place there I’m very impressed well organized! Hey buddy you have an incredible place there I’m very impressed well organized! They are right when they say everything is bigger in Texas!!!! Great web page also merry Christmas!! !